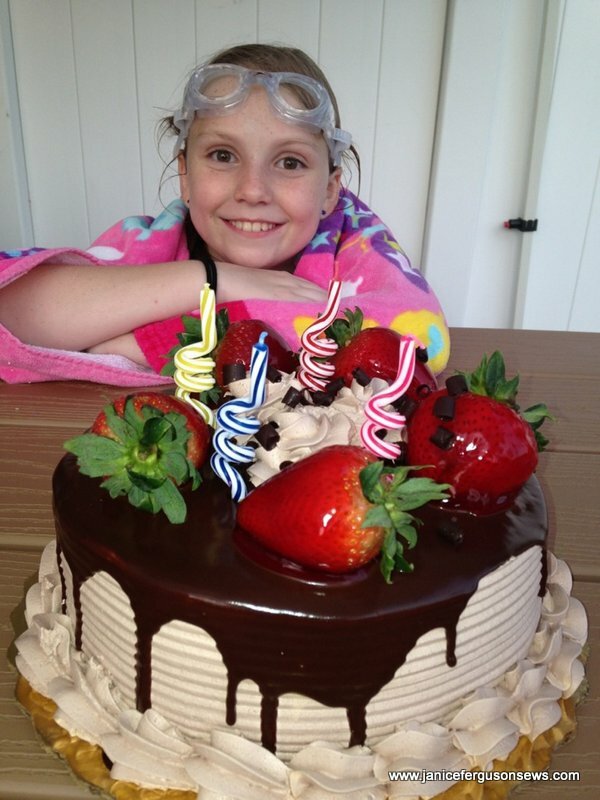 Granddaughter Laurel recently celebrated her 10th birthday at a resort hotel. Five of her closest friends and a few mothers had a big time enjoying all the activities and amenities typical of a resort hotel. 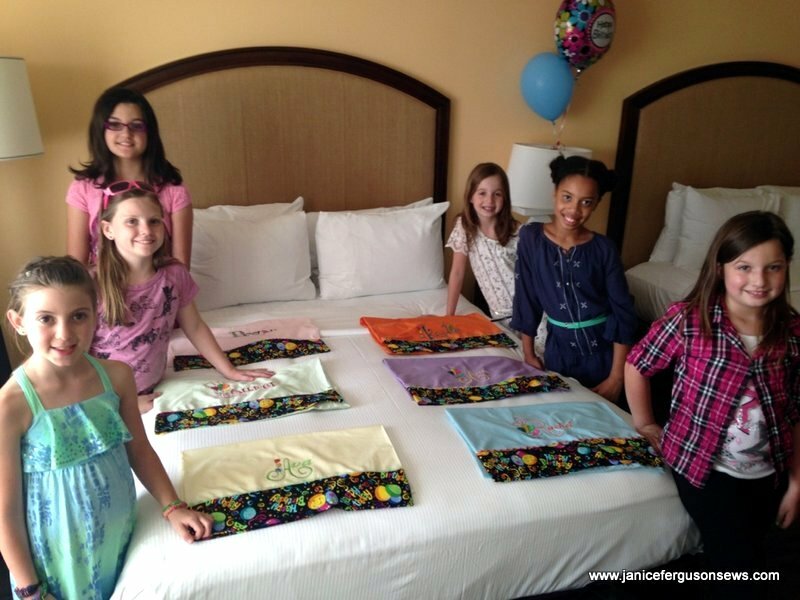 For party favors, a pillowcase was embroidered for each girl. I have been reluctant to post these photos because there is sooooo much puckering in the embroidery. It was caused by operator error–my use of inadequate stabilizer. But the girls were absolutely non-judgemental and seemed to love their personalized gift. Well, I promised this tutorial would be posted today “if the good Lord’s willin’ and the creeks don’t rise.” I have to tell you that I’m not sure the Lord was willing but the creeks did not rise. So I took the normal water level as a reluctant “okay” from above, even though just about everything else that could have thwarted my goal today did. After the pictures from my granddaughter’s 8th Spa-tacular Birthday Party were posted, the American Girl spa wrap has gotten a lot of attention, as well as many requests for the long promised tutorial. 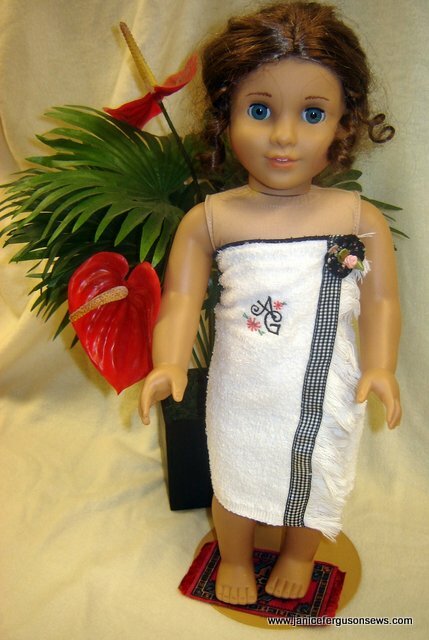 This is a follow up to the Girlie Spa Wrap for the girl doll owners. So all day and into the wee hours of early morning, I have held on to this tutorial mission with the determination of a Pit Bull. Finally, here it is. Please let me know if you find any errors. I didn’t have the luxury of reviewing this for a day or so before posting it. That makes me really nervous. Free Authentic American Girls Patterns! Back in the ’80’s Pleasant Company offered pattern packages for their historical doll wardrobes. Of course, the first dolls were all historical~Civil War era Addy, colonial girl Felicity, Minnesota prairie girl Kirsten, Victorian era Samantha, WW II Molly and 1824 New Mexican Josephina. 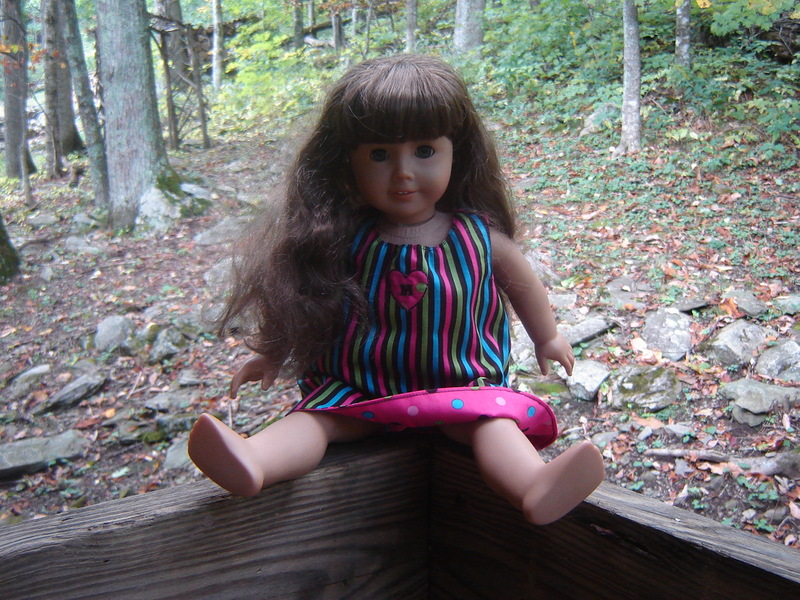 Each American Girl had a package with patterns specific to her period and culture. At the time, the $18 cost for each set of patterns seemed pricey. But the detailed patterns made it possible to authentically duplicate the original costumes, accessories, and available extra outfits for each doll. So they were popular with mamas, nanas and aunties who were eager to please a child. Molly in jumper which is a reverse match of Laurel’s. We’ve ordered a tee shirt for her to wear under this. When she moved into the dormitory at University of Florida, I custom made pima cotton sheets to fit her non-standard size bunk mattress. 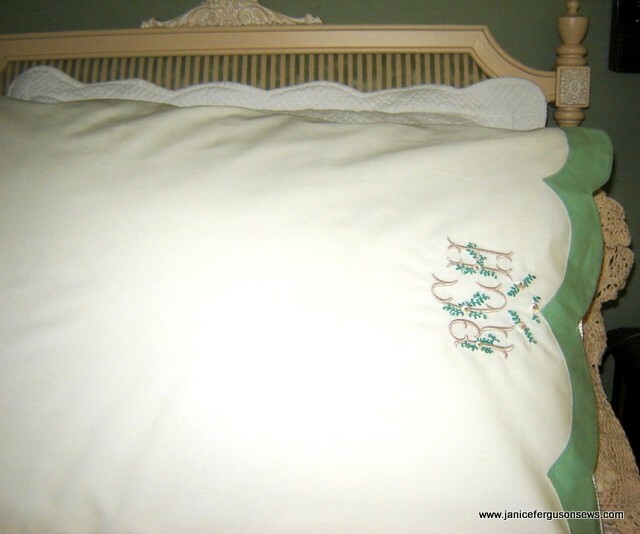 Then for each subsequent housing situation, from the sorority house to apartments, each year through graduate school, new pima cotton sheets and pillowcases were made and monogrammed, often with a matching quilt. I loved making them and she loved sleeping on them. 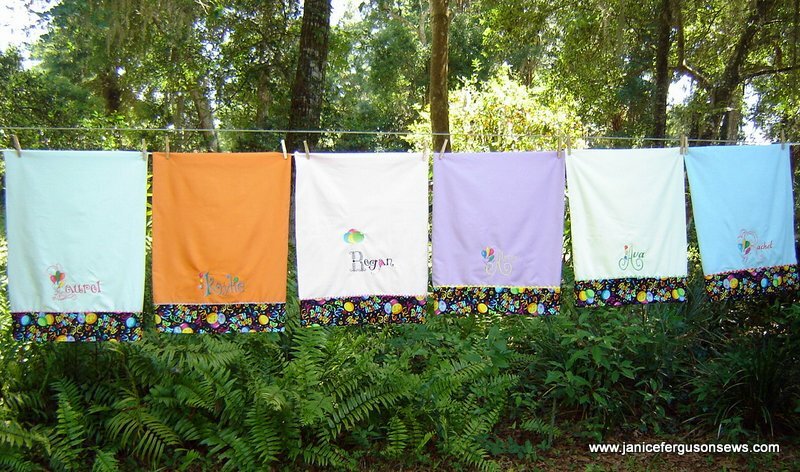 But then I got busy with grandchildren so it has been a long time since she has had any new pillowcases. This pair, pima cotton of course, is for her birthday. 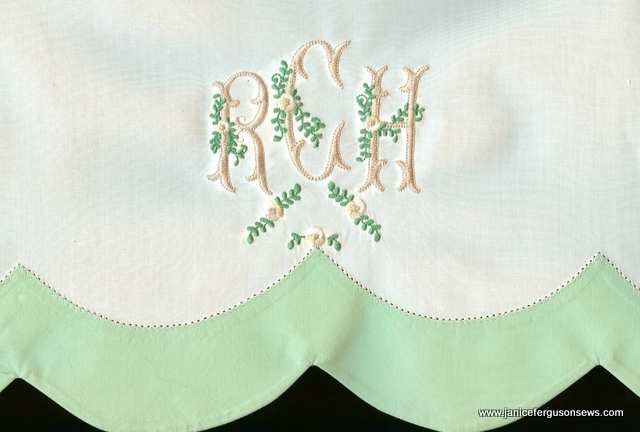 The scalloped Madeira applique hem is pinstitched in place, crowned with her new married -lady monogram. The design is from Martha Pullen’s 2003 Internet Embroidery Club alphabet.